The drought statuses for every county within the state have been updated. The South Carolina Drought Response Committee, which is comprised of representatives from multiple state and local agencies, met via conference call Wednesday to update the drought statuses for all counties within the state. According to information provided by SCDNR State Climatologist Hope Mizzell, some counties in the Upstate have received less than ten percent of normal rainfall throughout the last 60 days, intensifying the impacts to agriculture, increasing concern regarding forest fires and lowering streamflow and lake levels. "It is rare to see such a range of extremes with Myrtle Beach receiving over 33 inches of rain over the last 60 days, while Easley reports only 75 one-hundredths of an inch," Mizzell stated. The committee faces a challenge as it tries to agree on a declaration for each county that takes into consideration multiple factors, including agriculture, forest fire risk, water supply and water quality. "The committee will closely monitor the situation since the forecast is for a continued pattern of below normal rainfall," Drought Response Committee Chairman Ken Rentiers stated. 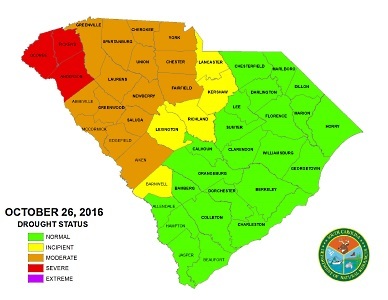 According to the S.C. Department of Agriculture, fields in the Pee Dee are drying out from Hurricane Matthew and the worsening drought in the Upstate and Piedmont is weighing heavily on livestock and crops. "I have heard from farmers, extension agents, and our staff in the Upstate that yields on summer pasture, forages, and row crops may be down by 50 to 70 percent," Commissioner Hugh Weathers stated. "The data collected from the weekly crop progress reports confirm degradation of range and pasture conditions and minimal soil moisture." As for wildfires, the numbers are near average levels. But to extinguish the fires occurring in the Upstate, particularly those in the mountains, more time and resources are required. "Wildfires occurring in the mountains and Piedmont are exhibiting aggressive fire behavior, therefore increasing safety concerns," S.C. Forestry Commission Fire Staff Forester Brad Bramlett said. "The main fire season in South Carolina is usually December through April. The dry conditions in the upper parts of the state have made the environment right for that to move up sooner. We advise that all outdoor burning be conducted with extreme caution." Streamflow conditions in the Upper Savannah and Upper Santee Basins have been below normal for much of the past six months, and those conditions have worsened since early to mid-September as the result of continued low rainfall patterns. "Subsequently, lake levels in these basins continue to drop with Lake Hartwell and Lake Thurmond down approximately seven and eight feet, and Lake Greenwood and Lake Murray both down approximately two feet," SCDNR Hydrologist Scott Harder said. "The streamflow and lake level conditions supported the decision to upgrade the drought statuses to severe for Oconee, Pickens and Anderson Counties, and to moderate for the other Upstate counties in the Piedmont." Counties in other portions of the state were upgraded to normal drought statuses due to above normal rainfall over the last 60 days. "Three tropical systems since Sept. 1 brought an abundance of rainfall and flooding to portions of South Carolina," Mizzell explained, "but the Upstate missed out on all three rain events."